Feeling Lucky? WIN BIG TODAY at Gallery Furniture! You are here: Home › Sleep Center Blog › GF in the Community › Feeling Lucky? 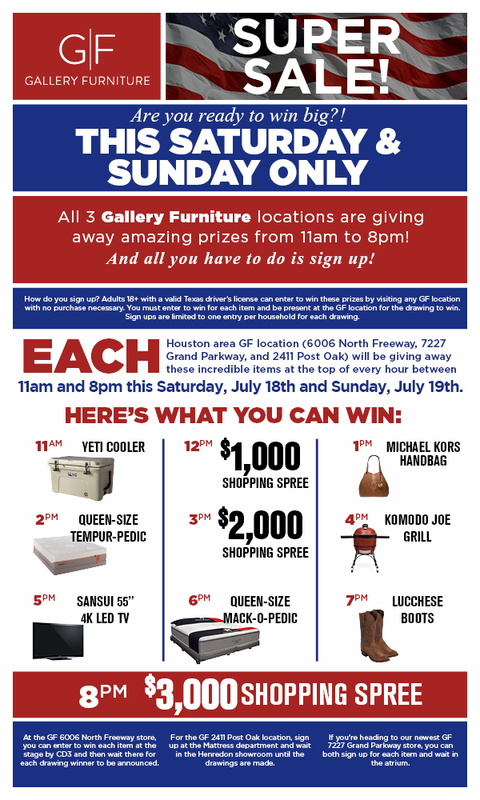 WIN BIG TODAY at Gallery Furniture! Are you ready to win big at our Gallery Furniture Super Sale TODAY ?! THIS SATURDAY AND SUNDAY ONLY all three Gallery Furniture locations are giving away amazing prizes from 11am to 8pm! And all you have to do is sign up! How do you sign up? Adults 18+ with a valid Texas driver’s license can enter to win these prizes by visiting any GF location with no purchase necessary. You must enter to win for each item and be present at the GF location for the drawing to win. Sign ups are limited to one entry per household for each drawing. At the GF 6006 North Freeway store, you can enter to win each item at the stage by CD3 and then wait there for each drawing winner to be announced. For the GF 2411 Post Oak location, sign up at the Mattress department and wait in the Henredon showroom until the drawings are made. If you’re heading to our newest GF 7227 Grand Parkway store, you can both sign up for each item and wait in the atrium. And as a special bonus, people waiting in line before the stores open to sign up will receive a coupon for $250 off a GF purchase of $2000 or more, valid for only the day it’s received. Good Luck!